I mentioned back in July, 2012 that the folks at Hammock Bliss had come out with a new product, the Sky Bed. Since Dov, the owner, was driving through my hometown en route to the Summer Outdoor Retailer Show, he was kind enough to give me a sneak peek at his new creation. Months later, Dov sent me a production sample to review. I was elated. I’ve been using the Hammock Bliss Sky Bed off-and-on for a few months now and have really been enjoying it. What makes the Sky Bed unique among gathered-end hammocks is that it has been engineered with an asymmetric lay. In other words, the diagonal sleep position is built-in. This is the first time a fabric-based hammock has been cut and sewn with a true asymmetric design[1. You could argue that the EXPED Ergo Hammock Combi was the first, but the build strategy is different.]. Instead of just laying diagonally in a bed of rectangular fabric, the Sky Bed has been constructed from panels of ripstop parachute nylon fabric—almost like origami—creating a nearly flat bed-like lay. The Sky Bed is actually wider in the middle and narrower at the ends. 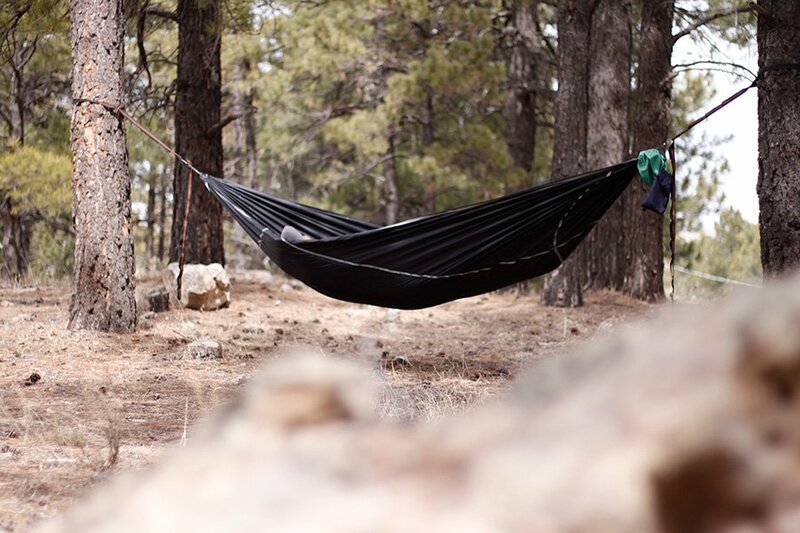 But it’s not just the asymmetric design that makes this hammock sleep flatter, the Sky Bed has an integrated pad sleeve (made from parachute nylon) that can accommodate common backpacking pads up to 20 in (51 cm) wide and 72 in (183 cm) long. From my testing, I can say that it’s really the pad that helps the most in flattening this hammock, but the design is integral to this taking place. When I test hammocks, I often spend several nights with it indoors as a sort of “controlled environment.” This also gives my family opportunities to see what Dad is doing and participate themselves. My wife, who I might describe as “warming up” to hammocks, tends to be very fickle about which ones she likes and doesn’t. When she first laid in the Sky Bed, she gave an audible gasp. Along with our huge, woven Brazilian hammock, the Sky Bed is her new favorite. The Sky Bed comes stock with 100 in (254 cm) of 6 mm rope attached to each end for hanging. On one side, a simple stuff sack is sewn to store and pack the hammock. All the seams are reinforced with grey webbing, giving the otherwise black hammock a pinstripe look. There is a clear top and bottom side to this hammock. The pad sleeve should be on the inside of the hammock, not beneath it. This also means that the occupant must sleep in a prescribed diagonal lay with the head to the right and the feet to the left of center. If you flip the hammock over you can lay in the other direction but a pad will not fit or conform to the hammock body leaving air gaps due to the sleeve design. Under quilts work just fine with this hammock, however. 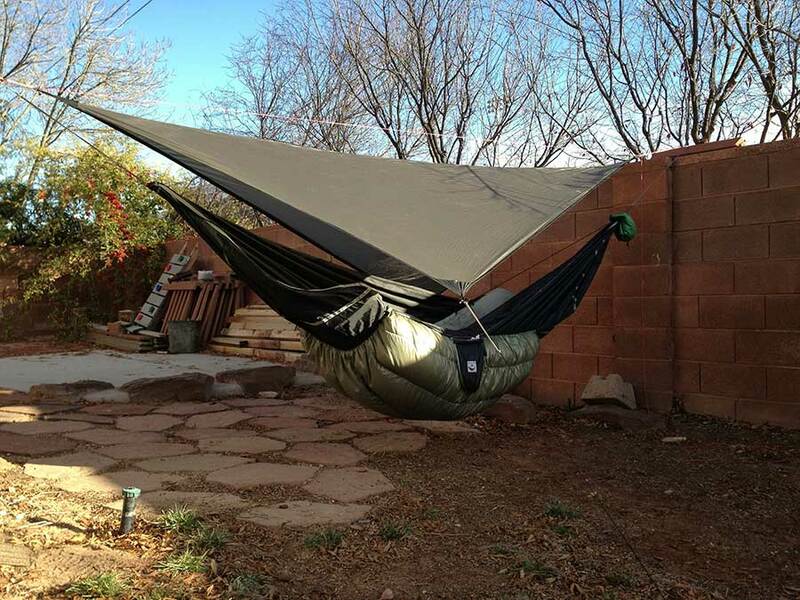 In the field, the hammock can be a little tricky to hang just right. Since the hammock has a fixed shape, it is important to hang it the same every time. In my testing, hanging it with too much sag or too tight across the anchor points curls the hammock and limits the flat lay. Adding a fixed ridge line to the hammock helps eliminate this issue. Without a ridge line, you might need to play a little with the hang angle. The Hammock Bliss Sky Bed with pad and an under quilt during the winter. I slept fine with just a pad to about 35°F (2°C), but below that and I needed extra insulation in the form of an under quilt for my torso and shoulders. With the pad, I only needed a 3-season under quilt when temperatures dropped into the 20s°F (-7°C). The pad ensured a consistent, reliable, and unbroken insulation layer from my head to my feet. Inflatable pads are ideal, but any 20 in (51 cm) pad will fit fine. Pads in hammocks are often unwieldy, as the two do not conform well to one another. The Sky Bed, in contrast, is perfectly matched to a pad, thanks to its engineered body and pad sleeve. Sleeves have been used in hammocks for some time to help keep the pad from slipping and moving, but the Sky Bed also uses the pad to add structure. I really enjoyed this hammock during the winter because of the added warmth from the full-length insulation. When temperatures dropped below freezing, I added an under quilt to keep my shoulders warm. One of the modifications I made to the hammock was to replace and upgrade the suspension. The Sky Bed comes with ample rope, similar to a Hennessy Hammock, but it isn’t my preferred method. I recommend getting some webbing straps to create an anchor point. Overall, the Sky Bed is a great hammock and my current favorite gathered end with an integrated pad sleeve. While double-layer hammocks provide a mechanism for holding a pad secure, the Sky Bed ensures the pad doesn’t shift and stays inline with the diagonal. The Sky Bed is a step forward in the evolution of hammock camping and is a great solution for folks transitioning to hammock camping because it takes the mystery (and sometimes the misery) out of finding the comfortably flat diagonal lay. In addition, the Sky Bed makes it easy to use the sleeping gear you already have, so you don’t have to spend more on custom under quilts and hammock gear. The asymmetric design also eliminates the floppy sidewalls and cocoon feeling prevalent in traditional Brazilian hammocks; the Sky Bed lays open and feels roomy. There are only two things really missing from this hammock to make it pitch-perfect for camping: an integrated, zippered bug net; and a ridge line to ensure a perfect hang every time. Both of these “missing” items area easily remedied with an add-on bug net and ridge line, so not a huge loss. Lacks an integrated bug net (not critical, but on my wish list none-the-less). Disclaimer: The author (Derek Hansen) was provided with a free sample from the manufacturer for testing and evaluation purposes. I’m 6’4″ – what are your thoughts on comfort for a taller hammocker? Also, I carry a Klymit Insulated V air pad – measures 23″ across, but can be marginally manipulated by adjusting the degree to which it is inflated… do you think this pad could be made to work in the integrated sleeve? I think you should give it a try, but the hammock might be at the limit of your height. The Sky Bed fits a 72 in (183 cm) long sleeping pad perfectly, so being taller, you may exceed what this hammocks is able to offer. As for the width of a pad, I think a 23 in (58 cm) wide pad would be fine. The sleeve has some extra “girth” for thicker pads, which could translate into a slightly wider pad. If you don’t inflate it too much I think it would work. That’s my best estimation; I’ve only used 20 in (51 cm) pads myself. Hi, We also reviewed this too! I really liked it and found it to allow me to lie flat, though the lack of a bug net was something that I think would be a great enhancement to it. We tested in summer, so can’t comment on how it would stand up in the cold weather like you experience (in fact I don’t think I want to go camping in -7C weather!). You can check our thoughts out here, if you are interested! Yes, an integrated bug netting would make this a great hammock camping kit. If it kept a bug net with its otherwise angular design, it would be sweet. That thing looks awsome! Exactly like what I’ve been trying to come up with myself, with little to no success though.. Guess it must’ve taken quite some tinkering to get it to work properly. Great review too, as usual! Cant wait ’til diy-plans start to pop up, I just have to give this style/model a go again now that someone showed it actually works! I so appreciate all your reviews. I am a side sleeper and almost fetal stomach at times. I understand a bridge type might not work so well for this. Your review of the Skybed looks like a good option. Any other hammocks that might work well in your experience for my sleeping style? The Skybed is a good hammock for side sleeping, but really, any gathered-end hammock will perform similarly. Bridge hammocks work okay for side sleeping, but they are slightly more tippy than gathered end hammocks because the spreader bars raise the center of gravity slightly. Have you tried side sleeping in a regular hammock, hung with a deep sag? I bought a Sky Bed a couple of months ago, and I can say it’s every bit as good as this review indicates. Top quality materials, although I too changed the suspension to webbing and cinch buckle. The flatter lay and no shoulder squeeze makes it the most comfortable sleep I have ever had when camping. +1 re the bug net, but I already had a Hammock Bliss mosquito net cocoon, which fits it perfectly, so I was fine. They now have a model with the mozzy net integrated so that’s a fix for HB. Great people to deal with too, with quick delivery. The only downside for me is the small integrated stuff sack. It’s a real challenge to pack the hammock into this pack, especially with the webbing suspension attached. (Not everyone’s obsessed with packing ultra small. I would be happy with an inch extra all around to make the pack up easier!). Great comments, Steve. I agree with your assessment of the stuff sack: I wish it were bigger too. Did you end up putting a ridgeline on the Sky Bed hammock? If so, what length did you use to achieve a flat lay? Hey Derek; Nice review. As a noobie to hammock camping and survivor of 4 spinal surgeries, I’m quite leery of anything that suggests that I might not be able to sleep in a flat position. This hammock would seem to allow that. The “Bug Free” model with the insect netting appears to deal with your worry about netting. I’m wondering you feel that the 32 oz. weight is excessive (it’s a lot); and if the fabric might be overly stretchy…. Also and very important: how will/would the sky bed bug free work with Snakeskins? Same question as “Hutzelbien”. Did you end up putting a ridgeline on the Sky Bed hammock? If so, what length did you use to achieve a flat lay? After one night and a few hours fussing I’m at 98″. Any longer and turning to lay on my left side is awkward and feels unstable. I never used a ridgeline but it is possible. The design of the hammock does favor one side.